Recently the Messianic Times has asked me to join their blogging team and post a once-a-month blog. We had some complications last month and it didn't make it, but as of today we are up and running. My "column" is called "Hear and Do" and is focused on addressing issues such as the struggle with hypocrisy among Believers (Messianics in particular), biblical ethics, Jewish prayer and more. Please keep this endeavor in your prayers. We are in serious need of exposure. We currently do not have the support we need to continue our mission. Please pray that this opens doors for Emet HaTorah and speaks to the hearts of our readers. I WOULD APPRECIATE YOUR CONTACTING THE MESSIANIC TIMES AND THANKING THEM FOR ADDING ME TO THEIR BLOG TEAM, so that they know people are reading the blog posts. The Torah is the terms of the covenant between God and His redeemed people. It was given, not just to Moses, but to an entire people at Sinai nearly 3500 years ago. It was God’s initial self-disclosure of His holiness and righteousness to an entire people group. Although the word messiah literally means “anointed one,” its connotation is that of king. It is a reference to the one who will bring all of Israel (and the entire world) into submission under a central authority. The king of Israel is required to write for himself a copy of the Torah in order to remember that he doesn’t have authority over the Torah, but that the Torah gives him his ruling authority and he must rule within its parameters — those parameters established at Sinai by the Creator of the Universe. Deuteronomy spells out these terms: And when he sits on the throne of his kingdom, he shall write for himself in a book a copy of this law, approved by the Levitical priests. And it shall be with him, and he shall read in it all the days of his life, that he may learn to fear the Lord his God by keeping all the words of this law and these statutes, and doing them, that his heart may not be lifted up above his brothers, and that he may not turn aside from the commandment, either to the right hand or to the left, so that he may continue long in his kingdom, he and his children, in Israel (Deuteronomy 17:18–20). Pirkei Avot, often called "Ethics of the Fathers," is a minor tractate of the Mishnah, the Oral Law of Judaism. However, rather than being a legal document, it is an ethical one filled with timeless wisdom which quite frequently intersects with the teachings of Yeshua. 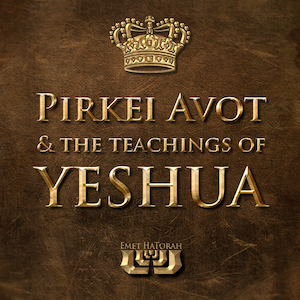 It is one of the most frequently studied texts within Judaism. We will be taking a high-level view of this text, but zooming in on particular sayings in order to compare and contrast them with the words of the Master. The first ten registrants will receive a FREE pocket edition Pirkei Avot (with Birkat Hamazon) to use during the course. This course is being taught in conjunction with and immediately follows the Introduction to Talmud & Mishnah course. Classes will be held at Kehillat Messianic Congregation, 151 Fred Rains Drive, Sherwood, AR.